Rosemead Boulevard in Temple City, California. Photo: Streetsblog L.A. When we sat down to make the inaugural 2013 edition of this list, we had a few superstars up top: Chicago’s transformative Dearborn Street, Indianapolis’s spectacular Cultural Trail. But last year also had what sports fans might call a shallow bench. Outside a few cities, there just weren’t that many new protected bike lanes to choose from. We’re thrilled to observe, looking at our inventory of such projects around the country, that as of 2014 this is no longer the case. This was the year that saw protected lanes pop up in Tempe, Arizona; in Athens, Georgia; in Pentagon City, Virginia. Last year, half of the new mileage of protected bike lanes nationwide was in the Green Lane Project’s six focus cities. This year, protected bike lanes grew twice as fast, and our six focus cities accounted for less than a quarter of the new growth. As we wrote in August, protected bike lanes have become as American as deep-dish pizza. 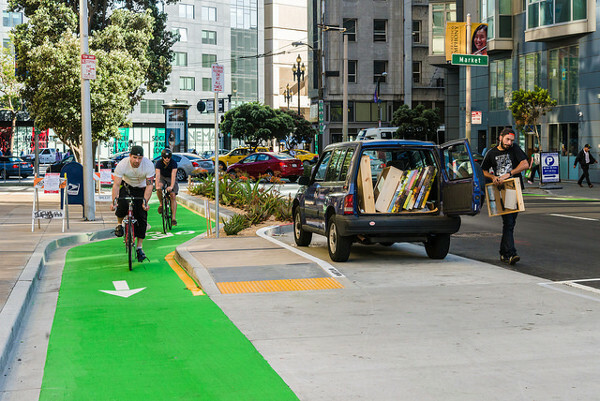 After the last 12 months of traveling the country, quizzing the experts and tracking the news, here are our picks for the 10 best new bike lanes of 2014. Photo: Sergio Ruiz via Streetsblog SF. The biggest obstacle to better biking in the United States is that most Americans simply haven’t gotten a taste of what “great” feels like. Polk Street is barely a third of a mile long, but no one who rides it will ever fail to realize how nice a bike lane can get — and thanks to its location one block from City Hall, that group now includes most of San Francisco’s supervisors. Polk, painted green on each side of a one-way street, is separated by curbs and a planter adorned with local cacti. San Francisco’s legendarily cautious public process kept this project in the works for 15 years, but when it finally opened last spring, Streetsblog called it “the best segment of bicycle infrastructure in San Francisco.” The subtext: these changes can’t pay off in ridership until they stretch further down Polk. In the next few years, we expect this demo to prove that greatness is contagious. It was 2010 when Seattle news site PubliCola called 2nd Avenue’s old stripe of door-zone white paint “The Worst Bike Lane in the City.” So many rejoiced when Mayor Ed Murray announced in May that 2nd would be the site of downtown’s first protected bike lane, and that it’d be finished in just four months. The lane opened on schedule — but, tragically, nine days too late. A week before the new design was put in place, civil rights lawyer and new mom Sher Kung was killed by a left-turning truck while riding in the old painted lane. The bike-only signals that were about to be installed probably would have saved Kung’s life. 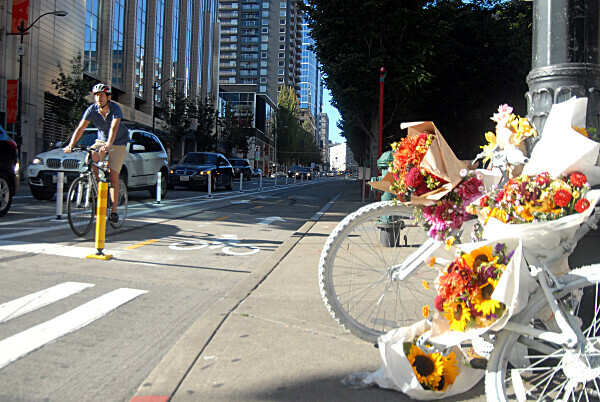 This fall, a ghost bike sat at the corner of 2nd and University — as much a memorial to Kung’s life as the platoons of riders rolling, safely and comfortably, in the new protected lane. In bike planning, Memphis is the anti-San Francisco. The city reasons that there’s no better way to make its planning process public than to rapidly get a project on the ground, listen to the ways people react to it, and adjust as needed. “Ready, fire, aim,” Memphis planner Kyle Wagenschutz says. Riverside Drive is a perfect example of that agile approach. Instead of reopening all four lanes to auto traffic after Riverside’s annual closure for the Memphis in May festival, the city restriped half the street to create two lanes of car traffic, a bidirectional median-protected bike lane and a walkway. Soon, this route will be the best link between downtown Memphis and the new Harahan Bridge crossing to Arkansas. 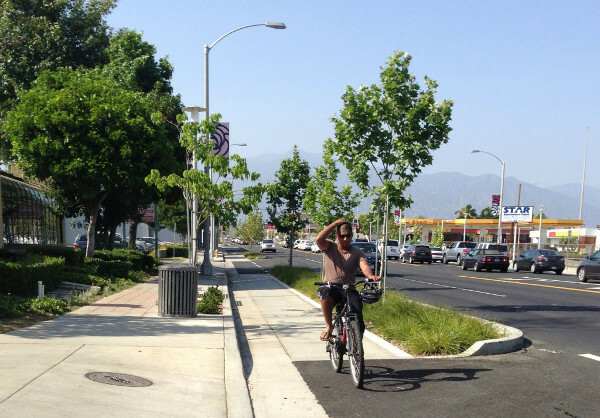 Protected bike lanes passed a milestone in 2014: they made it to the burbs. In Virginia’s Arlington County, Maryland’s North Bethesda and here northeast of Los Angeles, street designers proved that protected lanes can be even more important in sprawling areas than they are in urban ones — especially when they’re as straight and as visible as Rosemead’s. No wonder this project, which opened in May, is already inspiring nearby Pasadena. 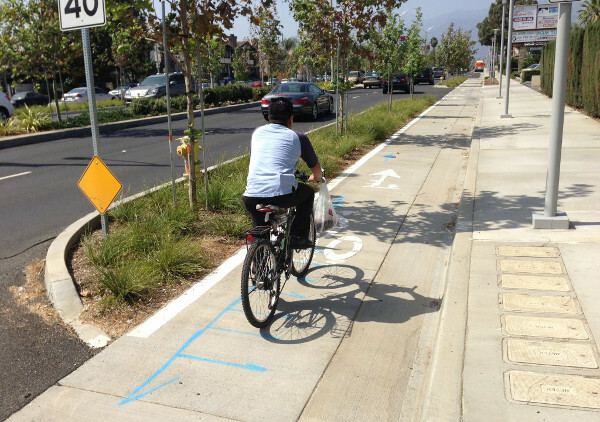 If outer Los Angeles can build bike lanes this nice, anyone can. Austinites spent 17 years arguing about whether a $1.2 million bridge should cross a creek that separates a relatively poor neighborhood from its local elementary school. When bridge proponents won, it might have been the end of the story — if city planners hadn’t asked whether, after all that, it might be a good idea to also think about the street between the bridge and the school. Eight months and $20,000 later, the city had used posts and paint along one side of an intersection-free road to create a safe and direct route to the school’s door. Seattle Bike Blog calls them “Smurf turds,” but we’ll just call them clever. The water-filled plastic loops combine with curbs, posts and parked cars to create a comfortable bikeway through the middle of one of the city’s densest commercial areas. Though we’re always wary to endorse a two-way protected lane on a two-way street, Broadway uses signal phasing and lots of green paint to keep bikes both separated and visible. Quality bike access to this major commercial street wouldn’t have happened any other way. The country’s bikingest metro area has been moving slower lately with bikweway upgrades, but it’s still thinking six moves ahead. When storm drainage plans required rain gardens along this key route through a bike-unfriendly neighborhood, the city threw in another $2 million to build a few blocks of elevated bike lane, too. The result, which separates bikes and auto traffic by its curb and a parking lane, is an oasis of bike-friendliness in Southwest Portland — but if nearby Barbur Boulevard gets a mass transit line and protected bike lanes of its own as proposed, Multnomah will suddenly become an essential link to the rest of the city. This project deserves its slot for vision alone. If Pittsburgh sticks with its plans, this rapidly executed project — announced in July, built by September — will become the spinal cord of a new on-street biking network that’ll link the city’s excellent riverside paths to commercial and cultural destinations downtown. Downtown business leaders lined up behind this project and Allegheny County followed too, promising connecting protected lanes on two nearby bridges. Though Penn’s not perfect, neither was the status quo — and hey, neither were you when you were four months old. 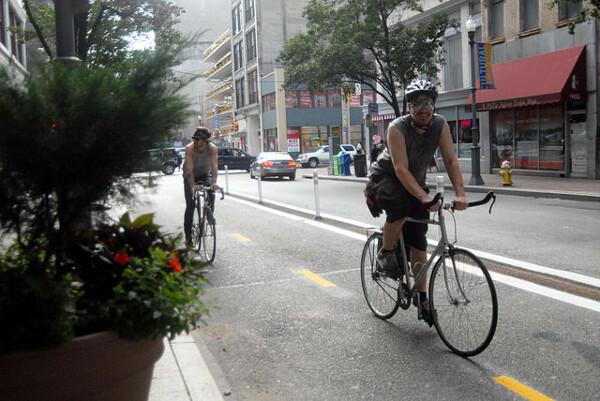 Pittsburgh has always been a city of action, and that’s its style with bike lanes too. 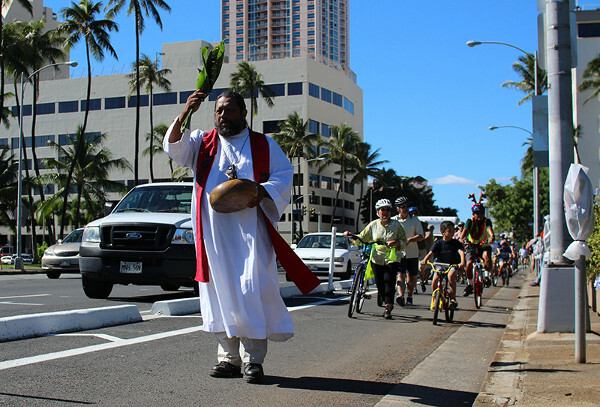 When this lane opened two weeks ago, the country quietly crossed a different milestone: Hawaii became the 26th U.S. state to get a protected bike lane. Temperate, flat and sunny, Honolulu could easily add “biking paradise” to its list of assets, and Mayor Kirk Caldwell seems dedicated to doing so. The bidirectional lane on King caught our eye for its length — two miles! — and its use of parking stops to create a nice temporary curb. Photo: John Greenfield, Streetsblog Chicago. After Mayor Rahm Emanuel took office in 2011, his transportation team whirled into action, laying down 12 miles of protected bike lanes almost immediately. 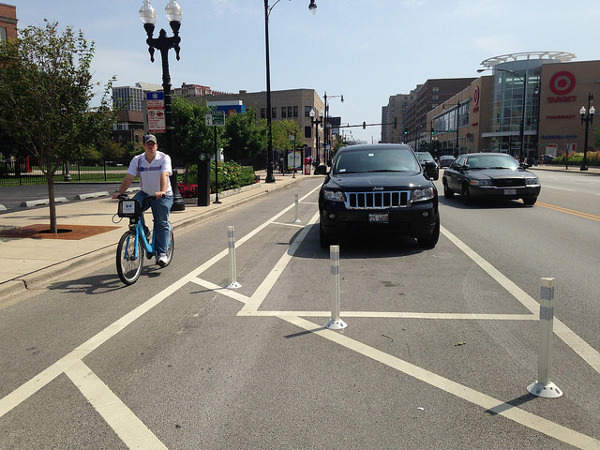 Three years later, Chicago is … still building protected lanes faster than almost any city in the country. Emanuel’s team added 3.25 miles in 2014, and a quarter-mile stretch of Broadway that offers one of the city’s few protected lanes through commercial districts is arguably the most useful of those. If the country’s embrace of bike transportation keeps accelerating, it’ll be because cities like Chicago turn solid projects like these into standard operating procedure. Is your favorite protected bike lane in our nationwide inventory? Check it out and send an email (with links to news coverage or photos, if possible) to maryam@peopleforbikes.org if we’ve missed anything. 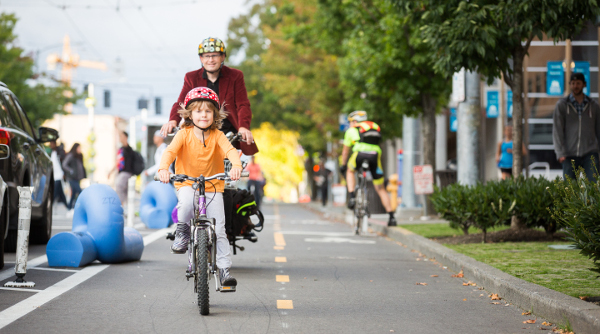 PlacesForBikes helps U.S. communities build better biking, faster. You can follow us on Twitter or Facebook or sign up for our weekly news digest about building all-ages biking networks. Story tip? Write michael@peopleforbikes.org.